Is oak the only acceptable wood for aging whiskey? 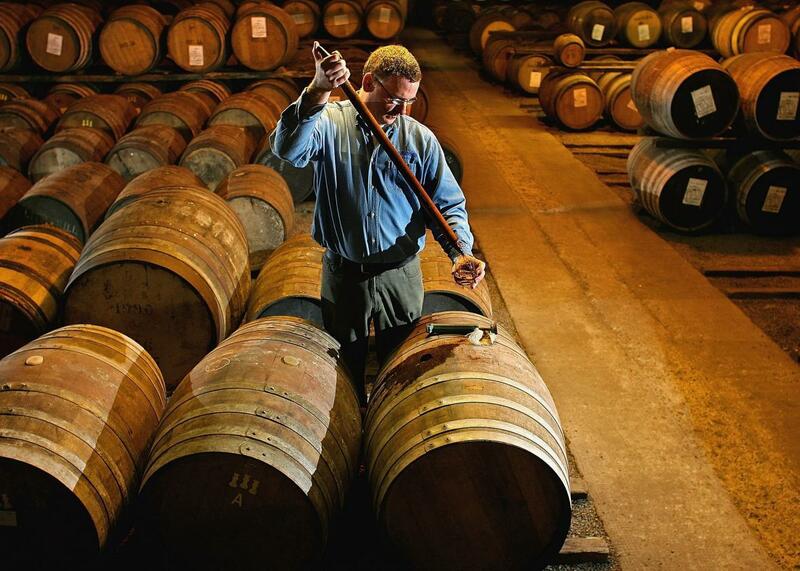 A worker at Bruichladdich Distillery in Scotland takes a whisky sample in 2006. Oak (especially American white oak) is far and away the most common type of wood used for making whiskey. However, it is not the only type used. Occasionally, other woods such as maple, hickory, and a host of others are used for aging whiskey. People who suggest that whiskey regulations prohibit the use of other woods are not entirely correct. While specific types of whiskey such as Scotch whisky and American bourbon do have such requirements, there are quite a few similar spirits that do not have such specific requirements. For instance, Canadian whiskey, Irish whiskey, and Japanese whiskey only require that wood barrels are used but don’t specify that oak is the only permissible type. In many cases, whiskey will be aged in casks formerly used for other types of potables, such as port, madeira, or sauternes. In those cases, the restrictions on the type of wood used will be determined by the rules of the original substance occupying the barrel. In the majority of those instances, the original wines (e.g. port, madeira, or sherry) do require oak as the barrel material, but the qualities of the former contents will affect the flavor of the whiskey along with the wood itself. Whiskey: What effect will a zero-gravity environment have on the aging of whiskey? Liquor and Spirits: What are some tips everyone should know when ordering drinks at a bar? Alcohol: Who was the first person to drink alcohol in space?